On 16 December 1917 a young boy was born to Charles Wright Clarke and Mary Nora Clark in Minehead, UK. He was christened as Arthur Charles Clarke. Arthur spent his happy childhood with his brother Fredrick, Michael and sister Mary. Suddenly at the age of 14 their father, Charles Wright Clark, died suddenly which affected Arthur's university admission at the time. Arthur was educated at Husis Grammar School in Thornton, UK. In 1936 he decided to come down to London with what he had saved by doing various part time jobs day and night. In London he joined the BIS (British Institute of Stars) where he was able to carry out many an experiment. This prompted him to contribute articles to the BIS magazine as well as to Science Fiction magazines. His first novel titled, "Rescue Party" reached the booksellers in England in 1945. During the Second World War he was conscripted to the Royal Air Force. This gave him first hand experience to experiment on Radar systems which were available at the time. During his RAF career, as the Officer in charge of the Section dealing with Radar equipment, he managed to use quite successfully his inborn skills. Out of the knowledge and experience he gained from his RAF career Arthur C. Clarke based his first novel 'Glide Path' and published it. At the end of the war he returned back to London and became the President of the BIS from 1946 to 1947 (and again from 1950 to 1953). On 15 June 1953 he got married to the American National Marilyn Mayfield but the marriage did not last more than a few months and ended up in a divorce in the same year. In December 1954 Arthur C. Clarke arrived in Sri Lanka as a visitor and decided to settle down in Sri Lanka from 1956 after selling his five bed roomed London house at Nightingale Road, North London, to his Sri Lankan friends, Dr. Buddhadasa and Karuni Bodhinayake. In 1954 he communicated with Dr. Harry Checksler, the Head of American observatory advising how Seattleite communication could be used to monitor weather conditions. Consequently Dr. Harry Cheksler having realised the valuable advice received from Arthur C. Clarke embarked on several experiments to monitor the variable weather conditions using rockets and satellites. In 1954 Arthur C. Clarke embarked on experiments along coastal regions in Sri Lanka and in 1962 published a book titled 'Profiles of Future', where he envisaged many prophesies in the future. Arthur C. Clarke did not confine his literal talents only to the subject of science but many of his scripts written for films such as 'A Space Odyssey 2001 - 2010' managed to grab several Oscars from the cinema world. Simultaneously he became a Radio and TV script writer and numerous stories such as 'Mysterious world' written in 1981 and 'World Strange Powers' in 1984 are still being televised from several countries the world over. As a novelist he has authored over 70 books. Out of such literal flushing out, novels such as 'Rendezvous with Rama, the Fountains of Paradise, A fall of Moon dust, and Star' have managed to capture literal Awards. In 1998 Arthur C. Clarke authored the novel '3001: Final Odyssey' and showed his refractive talents in acting too, by appearing in the film Without Warning in 1994. 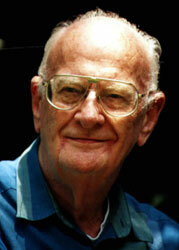 After 25 years Arthur C. Clarke was recognised for his extra ordinary innovative predictions. He was honoured with McCollum International Scholarship and received a gold Medal from Franklyn Institute. He was appointed as Professor at Ahamabad Institute of Physics, and received Lindbergh Award from London Kings College (University) to mention a few. On 16 December 2007 when he celebrated his 90th birthday in Sri Lanka Arthur C. Clarke, the Soldier, Author and renowned Science Fiction writer had bagged a Knighthood from Queen Elizabeth II in the UK, Nebula Award, Hugo Award, First Chancellorship from the International Planetary School and Chancellorship from the Katubedda University in Moratuwa, Sri Lanka, President of the Science Fiction Society, UK; Executive Committee Member of the International Planetary Centre and many other recognitions from all four corners of the world. Sir Arthur C. Clarke suffered from Post Poli Syndrome for nearly ten years which handicapped his movements and was compulsively confined to a wheel chair, yet he never neglected his dedicated work on the subject he loved so much. On his 90th Birthday Sir Arthur C. Clarke issued a statement to the Sri Lankan Editors Guild and said he was eagerly waiting to disclose some interesting and a scientific prediction to the press, but it was not be. He was suddenly taken ill and hospitalised with a chest infection and on 18 March 2008 he closed his eyes from all his future experiments and this world. Sir Arthur was a kind, and a humble human being with a magnanimous heart. Over 54 years while living in Sri Lanka he had contributed immensely towards Sri Lanka's Educational, Cultural and Scientific segments. He loved Sigiriya and called it the Fort of Sri Lanka. Also he identified Sigiriya as the 8th wonder in the world. Once he was engaged in a closer study and an investigation on ruins and mysterious rudiments found in olden records with the help of the late Senerath Paranavithana, Charles Godakumumure, Professor Senaka Bandara, the renowned archaeological experts in Sri Lanka. Sir Arthur C Clarke's decision to choose Sri Lanka as his home for over half a century itself is self explanatory to underwrite to the world what a beautiful country Sri Lanka is. For that matter Sir Arthur's contribution was indeed a great pride to Sri Lanka.